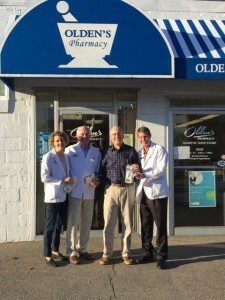 Olden’s Pharmacy Owners Joan and Bill MacArthur and Paul Hackett receive the Smiling Neighbor Award from Dr. Richard Wolfert, DMD. The corner drugstore. To those under the age of 40, that term might not mean anything. Unless, of course, you grew up in Weymouth and visited Olden’s Pharmacy. There you experienced not only the place where you got your prescriptions filled, but a business that cares about its customers and gives back to its community through sports team sponsorships, scholarships and any number of charitable endeavors. For those efforts and more, Bill and Joan MacArthur and Paul Hackett, owners of Olden Pharmacy, have been named the recipients of The Smiling Neighbor award given by South Weymouth Dentist Dr. Richard Wolfert, DMD. Olden’s Pharmacy supports a number of efforts throughout Weymouth. That includes sponsoring teams in a number of sports—soccer, T-ball, basketball, baseball, and more. In addition, the Pharmacy sponsors such events as: Christmas in the Square; Mayor Kay’s Holiday Event; Clean up Day; Farmer’s Market; Weymouth Food Pantry. Olden’s Pharmacy is also a South Shore Hospital President’s Circle donor. For being selected as the Smiling Neighbor, Bill, Joan and Paul had the choice of receiving a $50 gift card to Stockholders or a Sonicare Easy Clean model (they chose tooth brushes). The Toothboss accepts most insurance plans. They also accept payment from most PPO and indemnity plans, including Blue Cross/Blue Shield and Delta Dental. They also accept all major credit cards and have arranged payment plans through LendingClub.